Oblique aerial view of the remains of White Castle fort, taken from the SE. Oblique aerial view of the remains of White Castle fort, taken from the NNE. 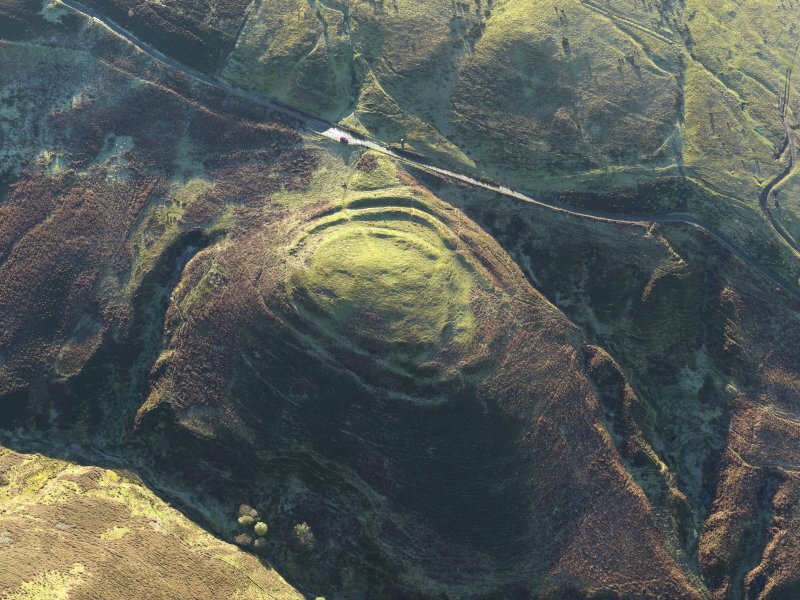 Oblique aerial view of the remains of White Castle fort, taken from the NE. 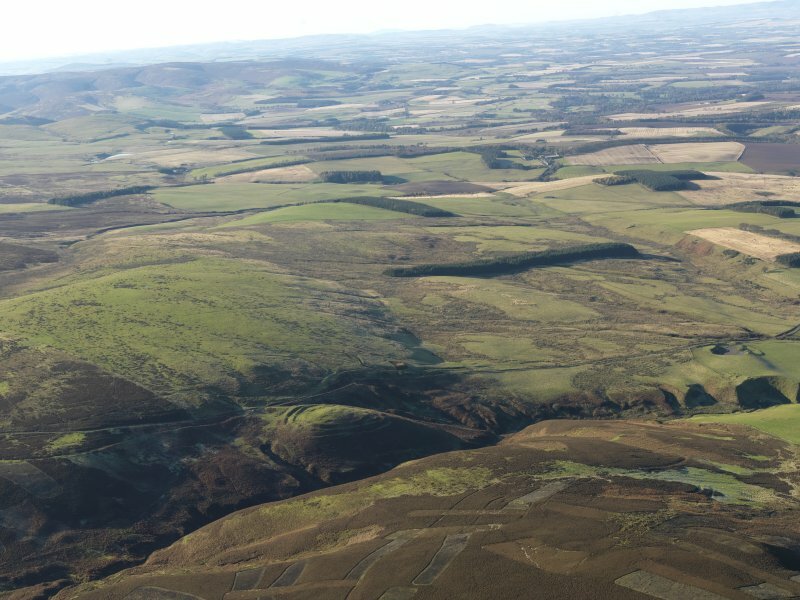 General oblique aerial view of the remains of White Castle fort with the East Lothian coastal plain beyond, taken from the E.
White Castle, an Early Iron Age fort, stands on a promontory (1,000ft OD) defended on three sides by steep slopes. It is oval on plan, measuring internally 230ft by 180ft, and is surrounded by triple ramparts which may have been topped by stone walls. 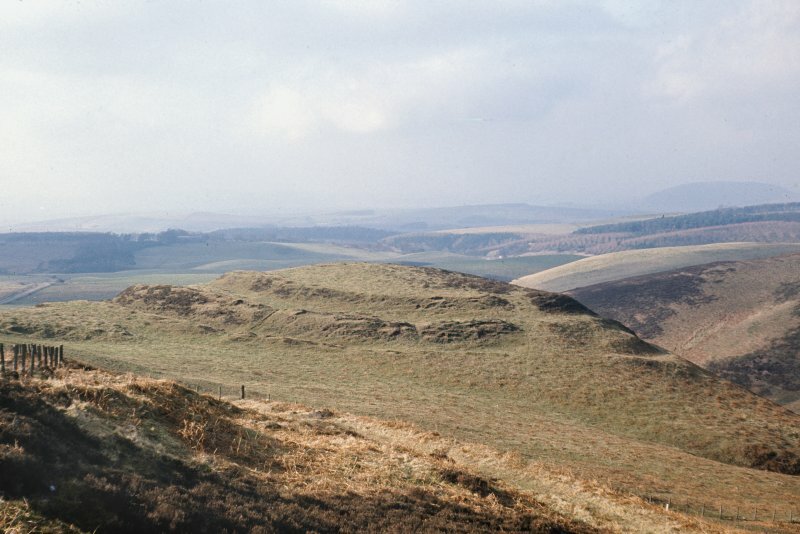 At least three possible hut circles, visible at the time of the RCAHMS visit in 1913 were not seen during the marginal lands survey (RCAHMS MSS). 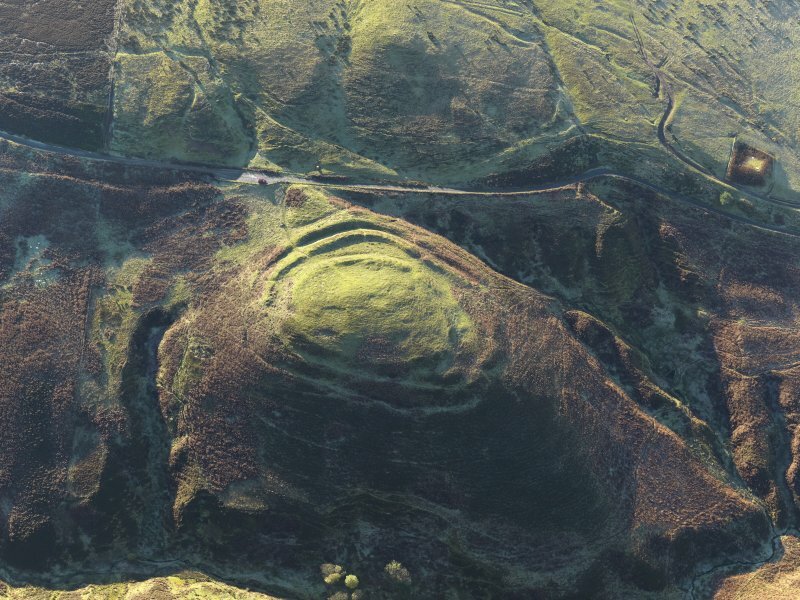 This fort is generally as described by the RCAHMS, although on the NE face there are clearly only two scarps, the third being the natural slope. 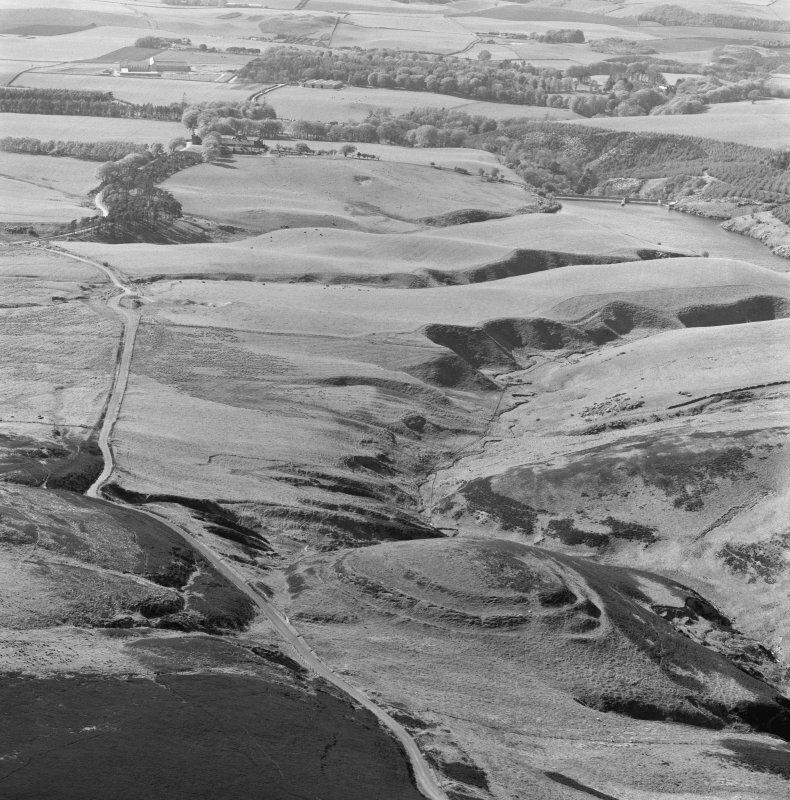 However, around the N and NE, between the inner scarp and the RCAHMS second scarp, there is a further scarp, an added line of defence, no doubt upon which was placed a wall; at this point there is a clear break in the defences, but whether or not this is original cannot be ascertained. Within the interior and between two of the ramparts there are several scoops, representing the site of timber huts. A watching brief was maintained during pipe-laying operations outside the fort on its SW and W sides. With the exception of an enigmatic feature (connected with hill drainage ?) seen in the pipeline section W of the fort, nothing of archaeological significance was noted. NT 6135 6860 The first season of a three season research excavation was carried out by volunteers and professionals during August 2010. 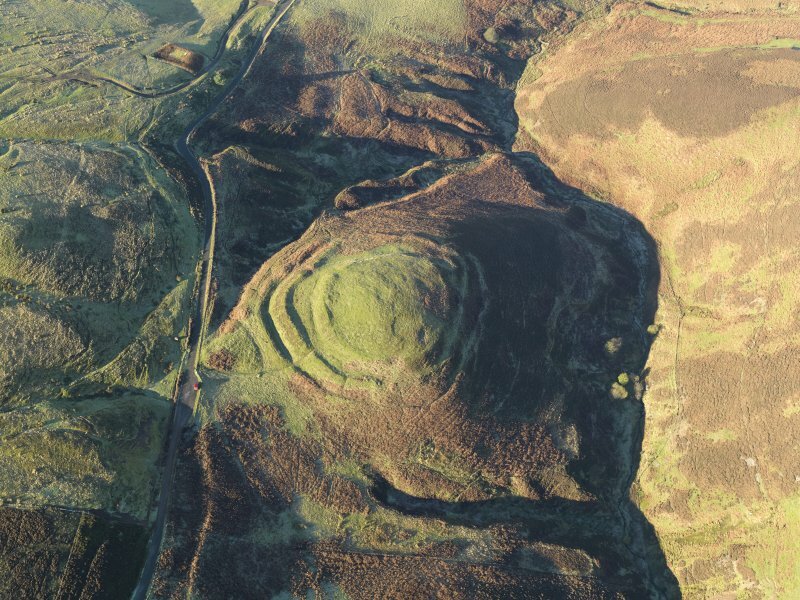 The work consisted of topographic, geophysical, vegetation and erosion surveys and the excavation of a single staggered trench (28.5 x 1m) across the defensive sequence to the S of the SE entrance. Eleven 1m2 test pits were also excavated around the exterior of the fort. hut platforms to 17. 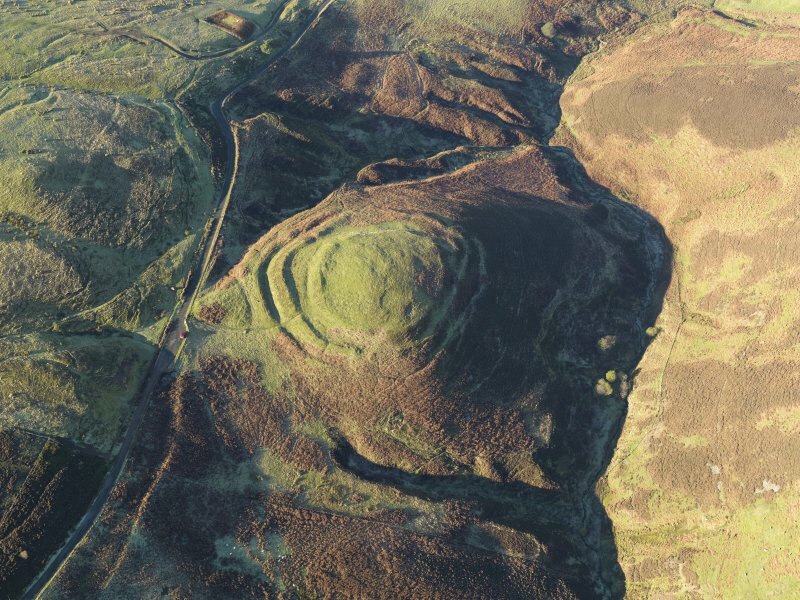 The erosion survey recorded the extent of damage to the monument from rabbits (moderate) and from encroaching bracken which is damaging sub-surface archaeology. The initial results of the fieldwork indicated that the inner rampart was constructed of soil and rubble between stone kerbs. It was 3.4m wide by 0.32m high and was associated with a 2.3m wide by 1.4m deep ditch. The middle and outer ramparts were constructed of soil and stone with a stone kerb on the downslope side. The middle rampart was 4.4m wide by 0.7m high and was of two phases. The outer rampart was 3.6m wide by 0.25m high. The outer bank overlay a cobbled surface which lay upon two possible cists. The test pits revealed no significant finds. NT 6135 6860 The second season of a four season research excavation was carried out by volunteers and professionals during July–August 2011. The work consisted of further topographic, geophysical, vegetation, erosion surveys, plus seven trenches and ten test pits. The excavation recovered a Neolithic flint scraper and a Bronze Age barbed and tanged arrowhead as well as identifying an external ditch, an internal hut platform and the presence of a palisade feature to the rear of the site. In addition, the middle and outer defences on the rear of the site were found to be simple terraces, rather than banks and ditches as they are at the front. NT 6135 6860 The third season of a four season research excavation was carried out by volunteers and professionals during July 2012. The work consisted of further topographic, geophysical, vegetation and erosion surveys, plus seven trenches. The excavation expanded upon three of the 2011 trenches (12, 13 and 18) to confirm the nature of Hut-Platform 08 and the putative palisade identified in Trenches 12, 13 and 18. The presence and nature of the palisade was confirmed and it was clear that it had been cut into underlying midden material. In addition, Hut Platform 08 overlay it and was itself covered by rubble spread from an upslope hut platform. Other trenches examined Hut Platform 04 and two of the SE gaps in the ramparts, to establish if they were breaches or entrances. The gaps were confirmed as entrances, although they had been subsequently eroded. Hut Platform 04 consisted of a substantial terrace cut into bedrock, with a foundation of larger rocks into which were cut a slot and a series of postholes. The slot feature may represent a drain. Finally, a single 1 x 1m trench was dug over a molehill to determine what if any impact they have on the underlying archaeological deposits. No impact was discovered. NT 6135 6860 The final season of the research excavation was carried out by volunteers and professionals during July 2013. The work consisted of further topographic, vegetation and erosion surveys, plus six trenches. The excavation expanded upon two of the trenches (33 and 34) in the NW entrance. This work confirmed the presence of posts, suggesting these represent formal gateways rather than cattle breaches, and ties in with the track which circles the site on the W side and then joins with the main entrance track. Trench 40 resolved into a platform, which had been cut into the inner rampart scarp and over the ditch filled with rubble from a dry stone wall revetment of the upper rampart bank. No structures were recognised, suggesting this was an open area rather than a hut platform. Trench 39 over the external ditch and bank showed that collapse had take place in a number of phases, suggesting the collapse of a deteriorating site. OSL sequencing was carried out on the ditch fill. Trench 41 confirmed the presence of a turf wall structure with heather matting which may have been a shepherd’s shelter. Trench 42 over the mound at the entrance had been placed to test a theory that it may have been a deliberate mound over a cist cemetery. No revetment or kerb stones were found, although there were two substantial postholes associated with the mound indicating that it may have formed part of an alternative entrance. Further post-excavation and research is ongoing to provide a full interpretation. 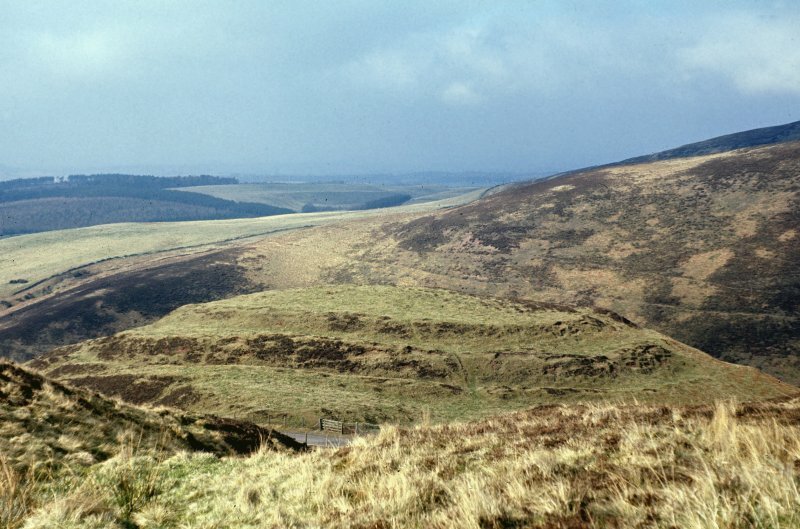 This fort, which is situated on a hillock in a cleft in the Lammermuir escarpment immediately NW of the minor road crossing from Garvald into the valley of the Whiteadder Water, commands extensive views out over the Lothian Plain to the NW. 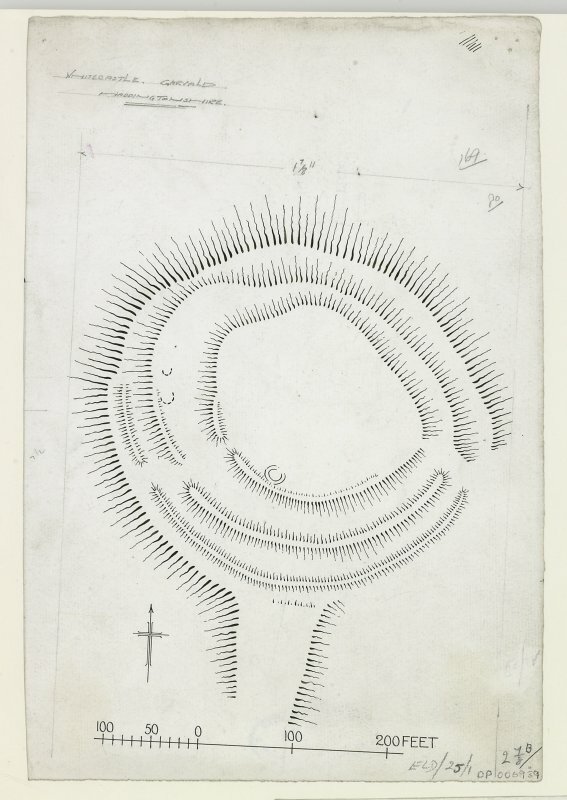 Oval on plan, its defences comprise two main elements, an inner oval enclosure with a single rampart and ditch, encircled by a slightly eccentric outer pair of ramparts with a medial ditch. The inner enclosure measures internally about 70m from NW to SE by 51m transversely (0.28ha), its rampart forming a low mound to either side of the entrance on the SW but elsewhere reduced to little more than a scarp dropping some 2.4m to traces of an external ditch; evaluation excavations 2010-13 showed that on the steep NE flank the crest-line of the rampart covered a row of timber posts. Entrances are visible on the SE, SW and NW, in each case corresponding to gaps in the outer defences, which enclose an area measuring 95m from NW to SE by 73m transversely (0.6ha). The most recent topographical survey during the recent evaluations has identified no fewer than eighteen platforms within the interior. On the strength of ten radiocarbon dates from a range of contexts, the excavators (Cook and Connolly 2013, 25-7) argue for three broad phases in which the eccentric and short-lived inner rampart was inserted into an earlier enclosure about 400 BC, but that the platforms represent ongoing occupation possibly as late as the beginning of the 2nd century BC; a single radiocarbon date from the outermost rampart falls in this last phase.